Qualities like durability, stylish beauty, and versatility have elevated slate stone flooring to become the preferred option for both homeowners and contractors. Whether installed in a new home or as replacement flooring in older ones, a variety of natural colors and patterns add elegance to any home. Waterproof and wear-resistant, natural slate tiles from PetraSlate in Denver manage heavy foot traffic, spills, and pets with no problem, maintaining the like-new appearance for decades. Some highly durable slate flooring is perfect for both indoor and outdoor uses. In addition to the luxurious and enduring qualities of slate tile, maintenance is far simpler than with any other flooring material. What Are Slate Stone Tiles? Slate is a natural rock, formed over millions of years underground in various parts of the world. The colors, patterns, and strength of natural slate result from heat and the tons of pressure from hundreds of feet of rock, soil, and other materials above it. Slate is indigenous to virtually every continent, although the characteristics of the material differ from location to location. 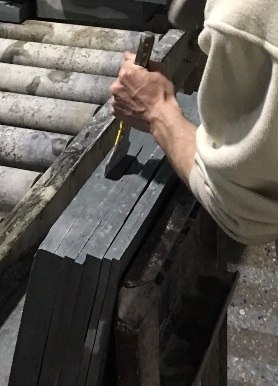 After mining, the slate rock is cut into the natural stone tiles to create unique stone flooring that will reflect the owner’s sense of personal style and desire for a beautiful and durable flooring. The general colors of slate tile available from PetraSlate in Denver range from almost black to a light silvery tone. Other shades include reddish copper to rose to mild and dark gray to an ocean green hue. PetraSlate in Denver offers 25 different slate tile patterns from which to choose. These slate materials were mined in China, India, Brazil, and the United States, and each slate pattern is unique. Due to the natural processes, the shades for each tile will be similar, though each piece will differ slightly from the next. When installed, the owner will enjoy a consistency of color with a broad range of interesting natural variations in pattern from quality slate. Square tiles are available to create a clean and symmetrical look. To create even more interest, PetraSlatelate offers various rectangular shapes to create eye-catching Versailles geometric floor patterns. PetraSlate’s slate stone tiles include 12”x12.”, 16”x16.” and 24”x24” squares. Also, a variety of rectangular shapes is available in many tiles that range from 16”x24” and 24”x24”. Tiles are cut to a thickness of ¼” to 5/16”. Custom cuts are also available. PetraSlate offers a full range of authentic slate floor tiles for indoor and outdoor installation. Their wide range of colors, designs, and sizes will fit both indoor and outdoor applications that impart a truly stylish and durable option. Call the experts at PetraSlate for more information at 303.280.9595.